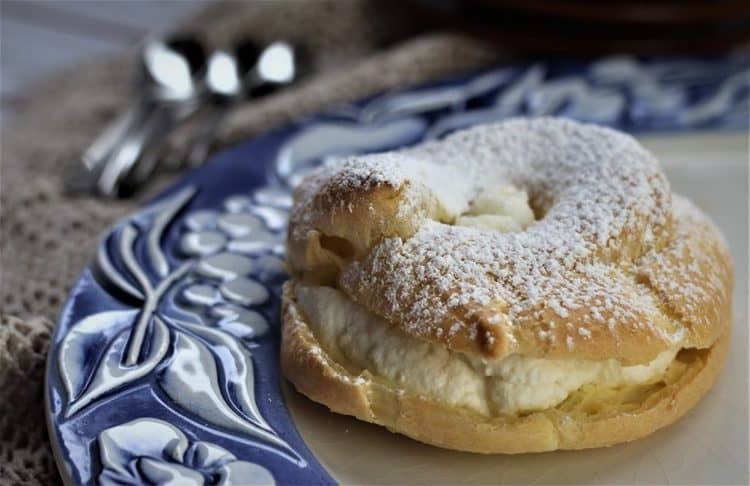 St-Joseph’s Day Baked Zeppole with Ricotta are enjoyed by Italians each year on March 19th. These lightened up zeppole are baked instead of fried but have all the flavors of traditional zeppole! 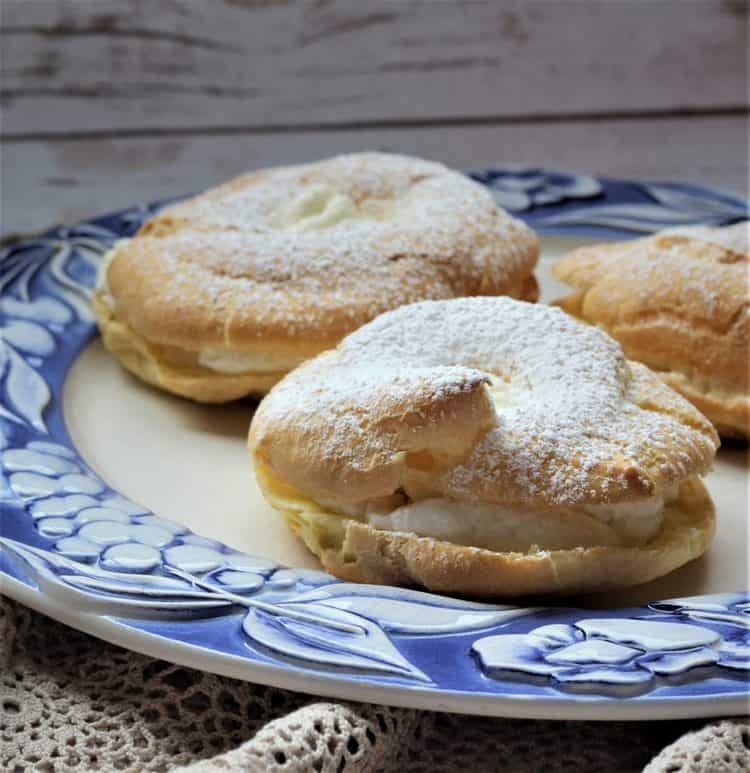 St-Joseph’s Day is upon us once again and it’s time to celebrate with another delicious creamy, ricotta filled dessert! So I’m sharing my version of this sweet with these St-Joseph’s Day Baked Zeppole with Ricotta! Most Italians celebrate this day each year on March 19th by eating zeppole. 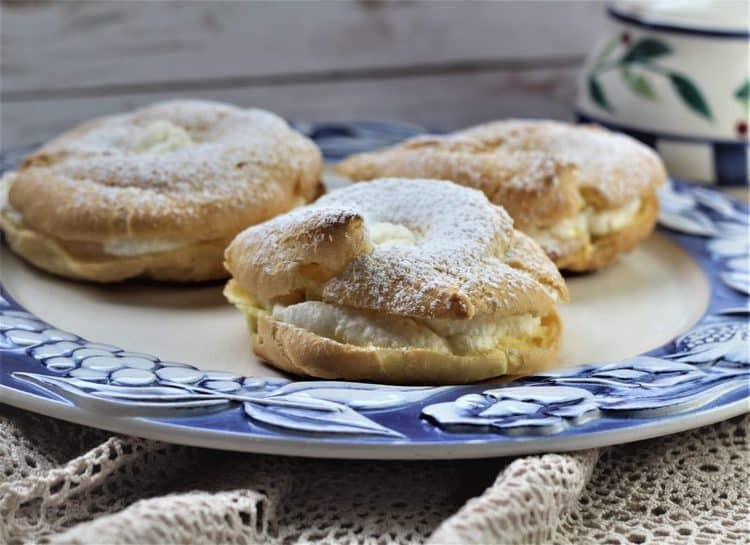 Have you noticed how many ricotta filled sweets are associated with Italian feasts? Just a few weeks ago I posted my ricotta filled Cassatelle in time for Carnevale. I appreciate any opportunity to eat a treat that’s stuffed with ricotta, sweet or savory. Zeppole can also be filled with custard but I choose ricotta every time. They are typically fried although most bakeries now offer a baked version which is what I’m sharing with you in this post. Zeppole are said to have originated from Sicily, although they are common throughout southern Italy. The word zeppole is derived from an Arabic word which means sweet fried dough. So I guess my recipe is not quite authentic since I baked mine! It starts with a basic pate à choux recipe, to which I added a bit more sugar to the dough. I then piped the dough into the typical doughnut shaped zeppole. Another alternative to the doughnut shape would be a round shape, just like a cream puff. I used a basic plastic freezer bag to pipe my dough. But if you’re savvy with a pastry bag you could use a star tip to pipe your dough. I then sweetened ricotta by mixing it with powdered sugar. If you prefer a creamier, richer ricotta filling you can also add some whipping cream to the mixture. Other possible add-ins are grated chocolate, cinnamon, lemon zest or even candied fruit. However, I prefer the simple, pure taste of the ricotta so I added nothing but powdered sugar. Once cooled, the shells are filled with the ricotta mixture and dusted with powdered sugar. And voilà, quick and easy zeppole. No fuss, no frying! If you try out my recipe, please let me know how much you enjoyed it by tagging me with your photos with #mangiabedda or @mangiabedda on Facebook or Instagram. You can also pin this recipe for later. 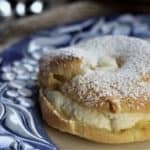 Just in time for St-Joseph's Day, this easy baked version of Zeppole are filled with sweetened ricotta. Give them a try and you'll be able to skip the trip to the bakery this year! Preheat oven to 425°F. In a medium sized sauce pan, combine the butter and water. Bring to a boil. Meanwhile, sift together the flour, salt and sugar. When the butter and water come to a rolling boil, remove the pan from the heat and dump the flour mixture in all at once, stirring with a wooden spoon until the flour is well incorporated. Return the pan to the heat and cook while stirring, for 1 minute. The mixture will form a ball and coat the pan with a thin film. Transfer the mixture to a standing mixer equipped with the paddle attachment. Add the eggs, one at a time, completely incorporating each one before adding the next. Beat until the dough gets thick and smooth. Place a medium sized freezer bag inside a measuring cup and fill with the dough. Seal the bag tightly, removing any air and snip off the bottom tip of the bag, creating approximately a 1 cm opening. Prepare a baking sheet by covering it with parchment paper and anchor it to the tray by dabbing a little of the dough in each corner. Pipe a 4 inch diameter circle onto the parchment paper and go over the circle with a second layer of dough. 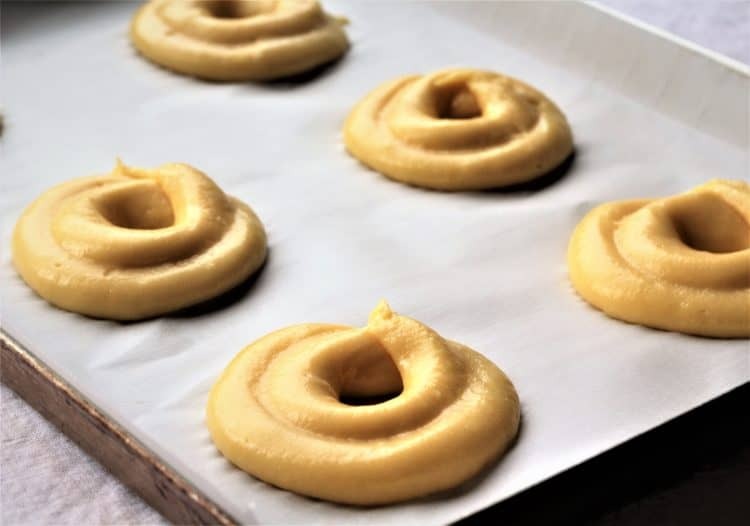 You want some height on the choux in order to be able to cut them in half and have an adequate space to pipe your filling into. Pipe the remaining dough. Bake for about 15 minutes, until golden and puffed. Reduce the heat to 350ºF and bake for another 10 minutes. Turn off the oven and leave the choux to dry for another 10 minutes. Allow to cool. To prepare filling, whisk ricotta with powdered sugar until smooth. When the choux have cooled, use a sharp knife and carefully slice in half. Pipe with the ricotta mixture and dust with powdered sugar before serving. Filled zeppole keep well up to 3 days, refrigerated. Hi Rosa, it’s 85 grams!